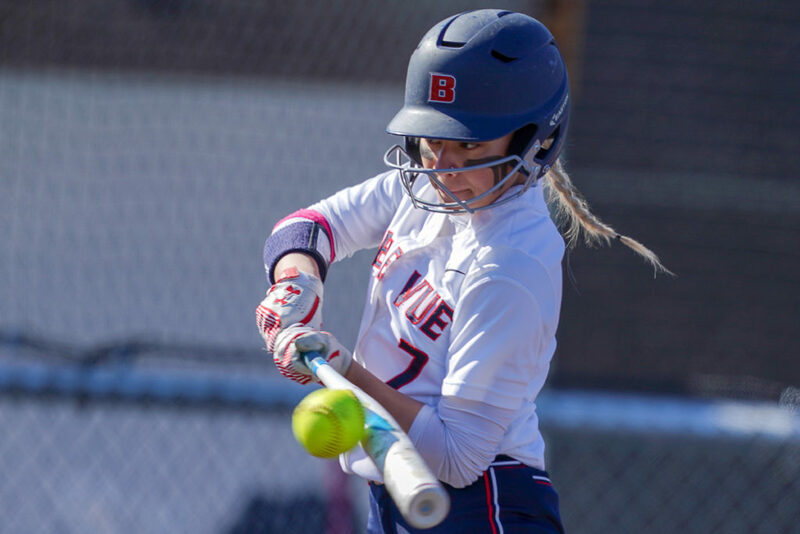 Bellevue College softball continued their offensive prowess by putting up double figure runs in all four games this weekend, sweeping Shoreline at home 11-3 and 12-4 on Thursday March 14 and Pierce by scores of 13-4 and 10-2 yesterday in Tacoma. In the Shoreline sweep, Rhaney Harris struck out 12 in the complete game in the circle for the Bulldogs as Bellevue put up six runs early and held a moderate 6-3 lead before a five run eruption in the sixth. Meg Marino hit a two-run home run in the second and led BC with three RBI’s. In game two, Marino continued her hot hitting with four more RBI’s while Tatum Dow and Angel Prewitt each had three hits. The Bulldogs were actually trailing in the nightcap 3-1 before Prewitt, Dow, and Marino all had RBI hits in the fourth to take the lead for good. In Bellevue’s first road league matchup yesterday at Pierce, Bellevue had a historical day at the plate as two Bulldogs recorded grand slam home runs. Dow hit a towering shot in the second to put Bellevue up 5-3 after staking Pierce to an early 2-1 lead. Mak Akers had a breakout performance with a grand slam in the blowout sixth, putting the Bulldogs up 13-4 which would ultimately be the final score. In the nightcap 10-2 win, Akers continued to ride her momentum by going 3-for-3 to lead the ‘dogs. Carissa McDowell went the distance in the circle giving up only six hits in the game. Bellevue is now 4-0 (15-2 overall) and are currently riding a 12-game winning streak. The Bulldogs get a break in action before playing at Olympic next Saturday March 23. First pitch is set for 12:00 p.m.